I’ve always felt that the duty of serious artists is not to please the public—but to speak the truth. And if the public doesn’t like it, then you take your lumps, because sooner or later that’s your function—and they’re going to see it. Unfortunately, we have to make a living from this—which is a sad state of affairs. We should be able to be honest without having to worry about whether or not it’s going to pay. That’s why I’ve ended up in the film scoring business. I don’t know if any of the work I’m doing is of any value. What I’m doing that I feel is of value is that I’m trying—through the only outlet I know, which is film music—to maintain a standard that appears to have evaporated. I will not succumb to the fact that I ought to go back and become a trendy rock writer, because I—that’s not what I am. I don’t think that trendy rock writers are speaking the truth any longer—they were for a minute. Folk singers have always spoken the truth, but trendy rock writers are no longer folk singers. They’re millionaires, and their purpose is to maintain that state of affairs, or to attain it if they haven’t yet done so. As for jazz—what happens there to the true artists? Bill Evans ought to be put under glass, and they ought to charge people to touch him—he’s that unusual. But you put Bill Evans in a club and across the street you run something like Jerry Lee Lewis, and it’s no contest who’s going to outdraw who. Jazz should be constantly appreciated, it should be reworked, it should be re–examined—just the way we re-examine Beethoven and Mozart every year. They’re not valid now either. I mean, I’m not about to sit down and write you a work out of the twentieth century that sounds anything like that. However, I’m not prepared to say that that’s never going to be played any more because it’s old stuff or it’s yesterday’s tune. Its value is its value—and that’s about where jazz has slipped. Now that Duke Ellington is dead, the period is gone. But the history of the period isn’t gone, and I think that the jazz of that period belonged in that period—and there’s no way on this green earth you’re going to revive it, have it be valid now, and have it sound like it did then. That’s impossible in all art forms. Everything belongs to its time—journalism, literature; certainly art and architecture. Nobody’s erecting rococo buildings any more. This is Schoenberg’s hundredth anniversary. Without a doubt, Schoenberg was a master, a great innovator, but I think it’s safe to say that he did not leave behind a treasure trove of works of inestimable value. What he left behind was a tradition and a path, and the means for an awful lot of other people to extend themselves. On the other hand, Bartok—whose every written note I virtually worshipped—died in abject poverty and has not yet been fully appreciated. That music is deathless, it’s there for ever—but, again, it’s music of a period. Now, I’ve got to take issue and express grave resentment with the certain element of the avant garde which suddenly begins to sneer at music that’s made up of notes, with time signatures, and on staffs and say, well, that’s old hat, you don’t do that any more. You’ve got to give the performers a chance to “do their thing” now. Well, then let them go have a session, and what do they need a composer for? You know, I’m tired of works that sound different in every performance. There’s no recognising some of this stuff on Tuesday night from the. performance of the same work on Monday; if you don’t feel the same, you have absolute freedom to do whatever you want to do. This whole syndrome is getting terribly akin to novelty and Dadaism, which we had in the ‘twenties. Historically, when you see this trendy art, it’s always an absolute reflection of the state of a society. It’s alarming to me, because when that is the accepted norm, we’re on the brink of a major upheaval. Which is the way the world seems to be going today. All the artist can do is simply hold up a warning sign. So to get back to me—as I grow older, I keep finding the more I do the more there is I find I want to do. And there are new areas within the framework of written traditional forms that are still to be done. I don’t have to go into electronic music yet, or hitting pianos with axes, or dropping them from the third storey and let’s record it as it hits the ground. There is much left in conventional forms that hasn’t even been tapped yet. I mean, we’re just really beginning to break away from the shackles of tonality, which Schoenberg a hundred years ago began to knock us away from, and which Charles Ives, without ever having heard of Schoenberg, somehow just began to go that way, because the wind was blowing like that, and some guys were sensitive to it. As to whether any of my scores stand up by themselves—in my opinion, they all do. At least, I make them to. I’m somewhat shocked myself to look back at things I’ve done years ago that still have a validity, that I forgot they had—although I’m not writing that way any more. I, too, have made my break with tonality—everybody who’s really serious about it has. And yet the successful film composers are writing stuff that should have been written in 1936—you know, the silly title tune that everybody can sing; you just do it thirty–eight times through the picture and you win yourself an Oscar. I’m not interested in that. I don’t care whether I ever win another Oscar nomination or not. I’ve had two, I have not won. Am I bitter about it? Yes, I am, and I’ll tell you why. Had I lost those races to something that I should have lost to—okay. That may be a matter of opinion, but when you lose to a picture that virtually has no score, but has a hit song, and the voters don’t know the difference between song and score, then I cry “foul.” Foul on whose part? Not on the part of my colleague who won that—more power to him. I’m crying “foul” against the Academy, which has failed to transmit what a score is; it has failed, I think. public relations–wise through the Press and every other way, to encourage or foster interest of any kind in the art and craft of motion picture scoring. Which is something entirely different again from song–writing. It’s a completely developable craft. And this is a special craft which I personally feel I do very well, because I’ve set my life to doing that. I’ve made it my business to know something about it. I don’t do it better than anybody possibly can do it, or even anybody alive—I do it as well as I know how. And I don’t know everything, but I’m damned interested in learning more about it. I’m terribly fascinated by the guys who are continuing to develop this craft. I think George De La Rue is one of them; also Richard Rodney Bennett, who is one of your finer composers here. 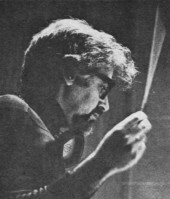 And Bernard Herrmann —he has somehow withdrawn in London some place, I understand, and doesn’t really do much any more—has been terribly slighted, overlooked and neglected. In my opinion, Bernie Herrmann is one of the most capable composers of the twentieth century. I think Alex North is, too. And when Alex North has difficulty getting a job —then there’s . certainly something wrong. The companies want to make scores now that have a record potential. Every picture won’t take that kind of score; there are only certain pictures, certain themes, that will. I’m not ready yet to say that the art of motion picture scoring is an invalid craft, it’s no longer needed, it’s old–fashioned. Nonsense—I don’t buy it. There are some pictures, sure, that work very well without any music; some pictures ought not to have any music. Cries And Whispers of Ingmar Bergman, which is one of the finest movies I ever saw in my life—there’s no written music in it, but the way dialogue and everything else is used in that picture is music. It’s just a work of art. I’m not really concerned with selling the value of a film score to thirteen–year–old kids, who want to buy rock records. Half of them are too young to go in and see these movies, anyway. You know, Straw Dogs is not a picture that anybody’s allowed to go into unless they’re over eighteen years old; I’m not going to worry about getting a rock hit out of it. It’s a very adult theme. The Wild Bunch was the other picture I was nominated for; it‘s an historical Western and I think it’s Sam Peckinpah’s finest movie. It’s a classic film now, it’ll never go away; but he was crucified for the violence in it—by today’s standard, it’s a nursery rhyme! Think of the horrors that are daily fare in the average picture today. That was only a few years ago, but they were after his head because he showed that it hurts when you get shot. He portrayed the West the way it really was. It was an uncomfortable, rough, dangerous place to be. The schoolmarm didn’t get off the bus looking like an ad for your underarm deodorant; she came looking a wreck, having ridden across the country without windows for two–and–a–half weeks. And for that I wrote a very heavy score, very romantic in the old sense, but it was about old Mexico in 1910. Well, Warner Brothers printed up five thousand of ‘em, and broke the master. They didn’t have a rock hit in it ! I’ve got the only box of Wild Bunch scores in existence, and I can sell ‘em for four hundred dollars apiece if I want to, right now. But do you think they’ll give me back those rights to put that album out myself in, say, Japan? Or any of the pictures I did for Michael Winner—The Mechanic, Scorpio or any of those—which did very well in Japan and Germany. I’ve had feelers for the rights for those things. I could make a lot of money if I could get those albums released, but it’s an American company and they don’t see that the return, as opposed to the cost, is worth it. They’re content to stay with their rock hits. These are the frustrations we have to live with.